Cathay Camera Club is an English language club which aims to bring together Hong Kong based photographers of all skill levels and nationalities who are keen to develop their photographic skills and techniques in a relaxed atmosphere. Founded in 1982 the Cathay Camera Club has invited Membership from anyone who wishes to improve the level of their photography, share their work with like-minded amateurs and in the process make new friends. We enjoy informative workshops, talks and demonstrations presented by visiting experts or club members. In addition each month we have both an Open and Special Subject photo competition with prints, digital images and slides critiqued by a visiting professional photographer, artist or, on occasion, a panel of Club Members. In addition to these regular meetings we sometimes get together for informal photography outings in Hong Kong and surrounding islands. We also organize public exhibitions where members can showcase their work in a more formal setting and have been holding Annual Exhibitions at the Cultural Centre in Tsim Sha Tsui for many years. The Club is governed by a Constitution and run by its Office Bearers and committee members. Our members are happy to share information and advice and vary from beginner to advanced amateur and on to semi professional, photographing in film, digital, black and white or colour. A highlight of the Cathay Camera Club is our lively competition nights, where members present their best pictures which are critiqued by visiting professional photographers and artists. Each competition is divided into two parts with members submitting images on a selected theme as well as an open category. The critique is given in a positive and constructive manner and may touch on topics ranging from a photo’s technical features to its concept and commercial value. Points are allocated to each picture which count towards an annual award. Details of this years competition nights and themes can be found on the Calendar page. In addition to the competition nights we also hold club nights where a visiting professional photographer, graphic artist or club member expert gives a talk or demonstration on a particular photographic technique or topic. Club night topics are decided at least one month in advanced and are announced on the front page or through the mailing list. 2017s workshops included a number of talks on image post processing with Lightroom and Photoshop. Group club outings and other activities are arranged on a semi-regular basis by club members. This is a great chance to learn from the more experienced club members as well as an enjoyable social outing. 2017s outings included a number of visits too (and backstage photography at) several Chiu Chow opera performances during this years Hungry Ghost Festival; images from which were featured in an article on the news site Hong Kong Free Press. In previous years club outings have included insect shooting in Sai Kung; night shoots in Jordan, Jat’s Incline and Yau Ma Tei; visits to Lamma Island, Macau and Zhaoqing; a two-day trip to Shantou; gallery and studio visits. Members are given the opportunity to showcase their work in an annual public exhibition. This year’s exhibition was held in September at The Tipping Point, 55 Elgin Street, SOHO. 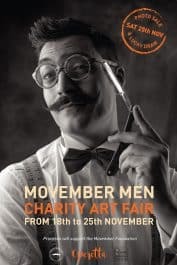 We also held an additional exhibition and fundraising auction entitled “Movember Men”, in support of the Movember Foundation, with a display and auction at Operetta in Pacific Place. In the past we have also exhibited at the Hong Kong Cultural Centre and the Fringe Club. Our 2010 exhibition ‘Rewind’ curated by Lorenza Mazzucco, featured 60 photos by 24 of our members. A panorama was made of the 2009 exhibition ‘Impressions’, and the flyers of 2008, 2007 and both 2006 iterations are now on display for posterity.